« Contact After Death – How Long Does It Take? I was thrilled recently to have coffee with a friend who shared with me the theory of the “Hundredth Monkey Effect“. I must admit, I had never heard or read anything in particular about it until today. Serendipitously, I had been searching for a way to explain what I felt was happening with the current Global Shift of Cosmic Consciousness. People have and are referring to it as The Awakening, Ascension or the New Age. I see it as the end of individualism and the beginning of collectivism; not the “end of the world”, but a new beginning that is in process and has been for quite some time. I began researching the Hundredth Monkey Effect and found varying opinions. Some think it to be only an urban legend. I’ve been involved in the paranormal investigation field for many years, and I agree that there is no exact science to prove the existence of life after death, ghosts, demons or psychokinesis. I have however had personal experiences with all these paranormal phenomena. Can I prove what I felt, saw or recorded? No, but with each situation there was an outcome, and that outcome was awe, with no explanation, just theory. I respect theories, for there is always some basis of truth, even if it’s a sliver. The ‘Hundredth Monkey Syndrome’ or effect refers to an experiment conducted by a scientist in 1952 in Koshima Japan on large numbers of Japanese Snow Monkey’s. The scientists at first gave them sweet potatoes to eat and the monkey’s enjoyed them – but the sand and dirt on them they didn’t…until one day an eighteen month old monkey named Amu washed her potato in some water. Amu’s mother saw this and followed suit. Between 1952 and 1958, all the younger monkeys began to do this by mimicking Amu and her friends, but some of the older monkeys did not. They continued to eat their sweet potatoes covered in dust and dirt. The fact that some of the older monkeys did not participate is the part I find most fascinating. Why? Perhaps with age their brains were so hardwired to the ‘old ways’ they could not compute doing it any other way, thus it became automatic behavior. Somewhere in this ten year period the monkeys began taking the potatoes and washing them in the Sea. Perhaps they liked the added salty flavor? The scientists decided to try a different experiment and threw rice onto the sand. Sure enough, one monkey took a handful of the rice and sand and threw it into the water, where instantly the sand settled and the rice floated to the top. Again, this habit of washing rice spread. The scientists had kept count of how many monkeys participated in this food washing behavior and discovered that once the number of monkeys who imitated the same behavior reached a critical mass of 100, many other monkeys automatically adopted this behavior as if it were an inborn instinct and not a learned behavior. The new food washing behavior spread is reported to also have spread to monkeys on neighboring islands, which could not be reached by the initial group of monkeys. There was therefore no way the could have demonstrated this behavior to monkeys on the other islands. It therefore appears that knowledge of this food washing method somehow spread telepathically or through some form of collective consciousness. 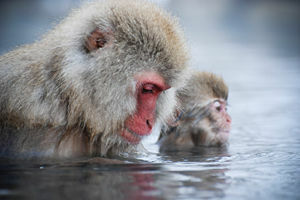 In time colonies of monkeys thousands of miles away began washing their fruit in the water. Physical behaviors being manifested in this manner are consistent with Carl Jung’s concepts of “simultaneous coincidences” or synchronicity in the consciousness of peoples separated by vast distances. This same phenomenon may be applied, for example, to the birth and spread of the European Renaissance. It is historically known that, within a half century (1400–1450) artists, sculptors and artisans appeared in all the major countries of Europe. Skeptics have claimed the story of this experiment to be an urban myth. Repeatedly, the concept of a collective consciousness is rejected as pseudoscience by the scientific community. The metaphysical community would be more apt to accept this as a sign of co-consciousness. The story of the ‘hundredth monkey phenomenon’ originates from Dr. Lyall Watson and his book Lifetide (1979). He had a Ph.D. in Ethology for work he had done at the London Zoo. In his book he wrote about several studies done in the 1960’s by several Japanese primatologists of the Japanese macaques monkey species (Macaca fuscata). Watson alleged that the scientists in those days were reluctant to publish the complete facts of their discovery, for fear of being ridiculed by their peers in the scientific community. According to Watson he had to gather the actual details of the story from personal anecdotes and existing folklore among primate researchers. To this day nobody knows for sure what the true facts of those experiments are. Be that as it may, the potential truth contained within this story does resonate with me and raises many metaphysical questions. Is all matter energy condensed into a slow vibration? Are we all one consciousness experiencing itself? Could a group manifested thought reach critical mass and become the property of our collective conscious awareness? I believe people all over the world are waking up to a new awareness or higher consciousness, and as they do each new awakened person adds that knowledge to the collective unconscious. Is this great awakening all coming down to taking back control of our minds? According to British author and public speaker David Icke the walls are now coming down, the ‘house of cards’, the illusion we have been living is in its death throes. Humanity’s imagination has been manipulated, making us believe that we are ordinary and powerless. Nonsense! Take your imagination back, take your power back! In the words of President Evo Morales of Bolivia, “imagine what the world could be if we as people would unite, we could end selfishness and begin brotherhood, end the sadness and begin joy, end hatred and begin love, it would be the end of division and the beginning of unity”.